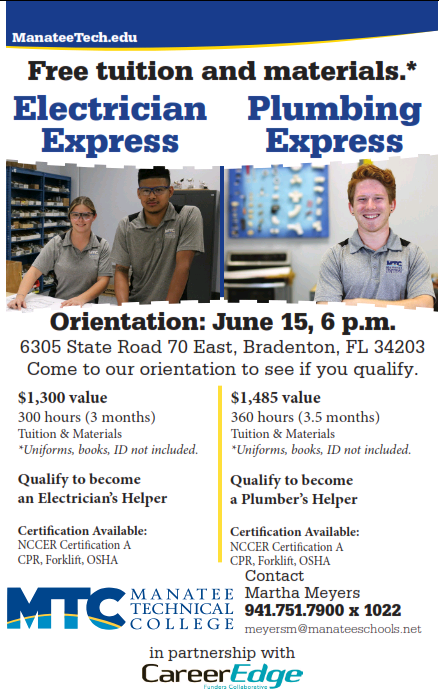 Tuition-free plumbing and electrical express courses, funded by CareerEdge Funders Collaborative, will be offered at Manatee Technical College. Orientation for all interested individuals will be held on June 15th at 6pm at Manatee Technical College, 6305 State Rd. 70 East, Bradenton Fl 34203. Upon completing both courses, students will become certified in multiple industry recognized credentials. Call Martha Meyers, 941-751-7900 x 1022, for more information. CareerEdge Spearheading Short-Term Certification Programs SRQ Magazine What Does Tax Reform Mean for Low- and Moderate-Income Workers?